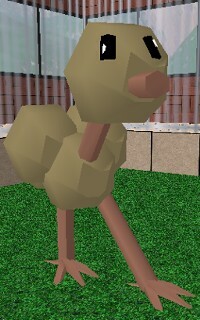 The Scaramu, or more commonly known as the Crazily Insane Emu, were created from an experiment gone wrong at the now-bulldozed SW City Weapons Factory. Some ammunition leaked into the local emu farm's water supply and they morphed into this incredibly dumb bird. Not alot of Scaramus are seen in the wild anymore these days, but a few are held in captivity at the Mango Land Zoo for public viewing. The birds that are in captive at the Mango Land Zoo draw among the biggest crowds of onlookers as they can usually be seen running around tripping over and running into things in a comical fashion. Scaramus are incredibly fast birds, reaching speeds of up to 50 km/h. In wide open fields, they have no problem achieving this speed but they have trouble finding their path to run in forests and other dense areas. Because of this, they can be spotted creeping very slowly and carefully, maneuvering around the obstacles. The bird can not fly either, but can sometimes lift-off the ground when running at high speeds if the wind is right. This is due to their low mass and position of their normally unfunctional wings. Their soft, slick feathers have been studied to have a high amount of lift as well which also contribute to the random lift-offs. They do not stay in the air long and usually do not even realize they are in the air, as their legs are still moving as if they were still running on the ground. Nests are made out of ten to twenty large branches and are very simple. They are built directly on the ground and can fit two fully grown birds. The locations of some nests are often in strange or dangerous places such as parking lots and helicopter landing pads. A Scaramu once built a nest on the middle boulevard of Highway 10 on Velothi Island overnight. Swarmy was called in to remove the nest and the guilty birds.